Jarett over with Products Worth the Price Tag has reviewed our One Less Skier and Logo bomb shirts and really digs 'em! 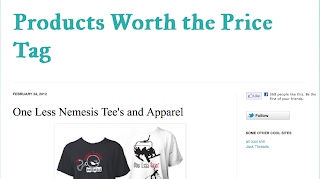 He was wearing is One Less Skier shirt as he posted the blog! He's also giving away a free tshirt, all you have to do is comment on his blog post to be entered to win. DO IT!